All of the mechanical calculators manufactured by Bell Punch were key-driven machines of the "Comptometer" type. For more information about the history and families of Plus and Sumlock mechanical calculators go to the page Introduction to Plus & Sumlock Mechanical Calculators. Plus 509/LD abbreviated-keyboard decimal calculator. Bell Punch Sumlock 912/S full-keyboard Sterling Currency calculator. 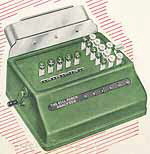 Petometer - Abbreviated, 9-column, decimal adding machine. Plus Adder - Abbreviated, 6-column, decimal adding machine. Plus Adder A - Abbreviated, 9-column, Sterling currency adding machine. Plus Adder B - Abbreviated, 9-column, Sterling currency adding machine (left column has only keys '4' & '5'). Seen with and without farthings. 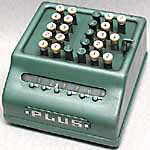 Plus Adder D - Abbreviated, 9-column, decimal currency adding machine. 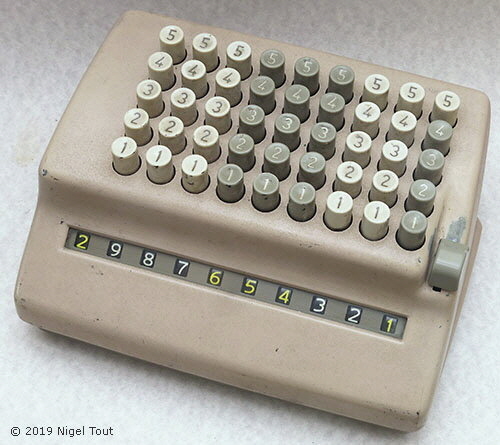 Plus Adder DA - Abbreviated, 9-column, decimal currency adding machine (left column has only keys '4' & '5'). Plus Adder S - Abbreviated, 9-column, Sterling currency adding machine. Plus Adder SJ - Abbreviated, 9-column, Sterling currency adding machine. Plus Adder ST - Abbreviated, 12-column, Sterling currency adding machine. These are all abbreviated keyboard models, that is they only have keys 1 to 5 in any column. To add a number higher than 5 then the operator has to press first one key and then another in that column which add up to the required number. In 1940 a larger, full keyboard (with numbers 1 to 9 in each column), machine under the name "Sumlock" was added to the range, and a separate company, London Computator Corporation, Limited, was incorporated to deal more efficiently with the sales side of the calculators. London Computator Corporation LC/509/KL/SF - Sterling Currency calculator with farthings and 'Key-lock' feature. London Computator Corporation 509/MD3 - Abbreviated decimal adding machine. London Computator Corporation 509/S - Abbreviated Sterling currency adding machine. London Computator Corporation LC/509/SF - Sterling Currency calculator with farthings. London Computator Corporation Sumlock 912/S - Sterling currency adding machine. London Computator Corporation LC/912/MD3 - Decimal adding machine. London Computator Corporation Sumlock LC/912/SF - Sterling Currency calculator. In 1950 the name of London Computator Ltd. was changed to Sumlock Limited, and this in turn became Sumlock Comptometer Limited in 1961 when the British operation of Comptometer Corporation was merged. List of later Plus, Sumlock, and Bell Punch manufactured "Comptometer-type" models. The first number denotes the maximum number of keys in a column, and the second and third numbers denote the number of columns of keys. The letter denotes the type of machine. Some of the machines distributed by London Computator Ltd. have the letters 'LC/' before the model number. Manually operated machines were often termed "Figureflow". Plus 506/C - Decimal Currency calculator. Plus 506/D - Decimal calculator. Plus 506/F - Sterling currency calculator with farthing keys. Plus 506/LD - Decimal calculator. Plus 506/S - Sterling currency calculator. Plus 509/C - Decimal Currency calculator. Plus 509/D - Decimal calculator. Plus 509/LD - Decimal calculator with 'round-off' feature. Plus 509/F - Sterling currency calculator, with farthing keys. Plus 509/HD - Decimal calculator with � key. Plus 509/S - Sterling currency calculator. Plus 509/SP - Imperial-Weight calculator. Plus 509/Y - Imperial-Weight calculator. Plus 512/C - Decimal Currency calculator. Plus 512/D - Decimal calculator. Plus 512/F - Sterling currency calculator, with farthing keys. Plus 512/S - Sterling Currency calculator. Plusograph - Decimal/Sterling Currency add-lister. see the Calculators made by others section. Sumlock 906/C - Decimal Currency calculator. Sumlock 906/CK - Decimal Currency calculator. Sumlock 909/C - Decimal Currency calculator. Sumlock 909/CK - Decimal Currency calculator. Sumlock 909/C/V - Decimal Currency calculator, electrically powered. Sumlock 909/D - Decimal calculator. Sumlock 909/F - Sterling currency calculator, with farthing keys. Sumlock 909/S - Sterling currency calculator. Sumlock 912/C - Decimal Currency calculator. Sumlock 912/D - Decimal calculator. Sumlock 912/F - Sterling Currency calculator, with farthing keys. Sumlock 912/S - Sterling Currency calculator. Sumlock 912/S/V - Sterling Currency calculator, electrically powered. Sumlock 912/Y - Imperial-Weight calculator. Sumlock 913/CP/S - Sterling Currency calculator with Certopost verification device. Automaticket Check Adder - Sterling currency calculator, with farthing keys. When the old Sterling Currency (�sd) was superseded by Decimal Currency it was common for old Sterling machines to be converted to Decimal machines and these could retain the old label with its '/S/' Sterling Currency designation. Sometimes the Sterling to Decimal conversion of a machine was done crudely by someone simply by removing the shillings and pence columns of keys and fitting a blanking plate. Sales brochure for Plus machines (pdf format). Sales brochure for Sumlock machines (pdf format). Sumlomatic - Has a multiplication register. Comptomatic 993 - appears to be the Sumlomatic renamed. Comptometer 993e - Electrically powered. Comptometer 993m - Manually powered. Comptometer 993s - Electrically powered, with storage (memory). Unilectric - Electrically powered, available in 909 (9-column) and 912 (12-column) models. Duoelectric - Electrically powered, with additional storage and rounding device, available in 909 (9-column) and 912 (12-column) models. Bell Punch Analyser - A basic adding machine with a small bank of counters. Note that the model designations of some of these machines, especially the Plus Adder models and the London Computator Corporation models, are not fully understood but from evidence are as listed. See the Introduction to the Mechanical Calculators for more information. A Bell Punch subsidiary which was renamed Sumlock Ltd. in 1950. Calculators distributed by Sumlock Ltd. and Sumlock Comptometer Ltd.
A Bell Punch subsidiary, Sumlock Ltd. was renamed Sumlock Comptometer Ltd. in 1961. Sumlock 912/F Sterling currency calculator with farthing keys. The models of the 993 family were the last new designs of mechanical "Comptometer"-type machines from Bell Punch, and probably the last in the world. These models have a new design of casing which is more angular. After 1961 the Bell Punch Co. produced mechanical machines for Comptometer Corporation of the U.S.A.
Comptometer 992, is similar to the previously U.S. manufactured Comptometer 3D11. Some Sumlock machines can be found labelled 'Comptometer' and with a different model number. Comptometer 9B is similar to a Sumlock 909, with the the more angular casing of the 993 models, illustrated above. Comptometer 12B is similar to a Sumlock 912. Comptometer 12D is similar to a Sumlock 912, with electric motor drive. 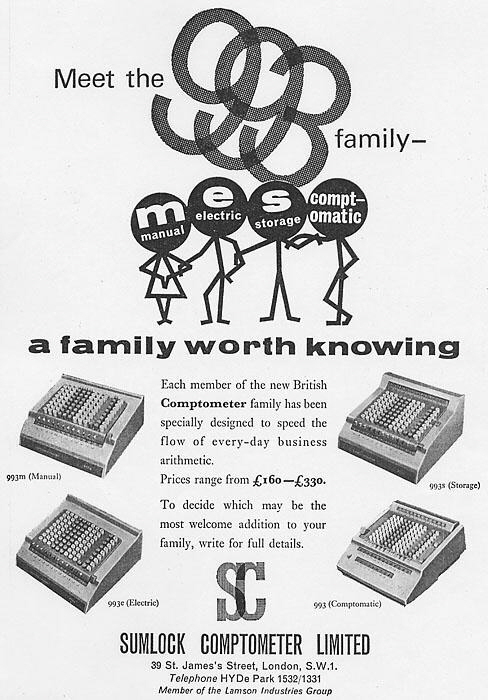 Further information about these 'Comptometer' models can be found on John Wolff's website at http://www.johnwolff.id.au/calculators/Comptometer/FT.htm#UK.